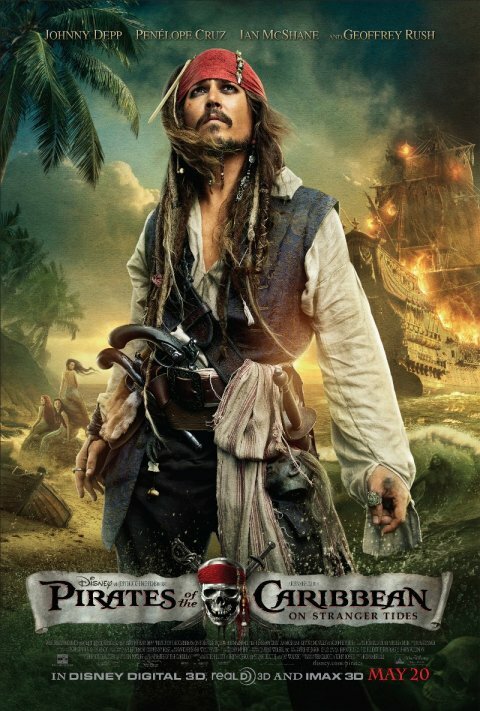 After greeting the world with arms outstretched and a gun in each hand in the banner ad for Pirates of the Caribbean: On Stranger Tides that we premiered last week, Jack Sparrow is front and center in a new poster for the move, this one premiering today at IGN. It's a much more traditional one-sheet poster than the one we saw last week, and uses the familiar dusty color scheme from the entire Pirates franchise, but even though the background is crammed with burning ships and alluring mermaids, there's a simplicity to it that I really like. Maybe it's the perplexed look on Jack's face, or the simple fact that he's not staring intensely at the viewer like so many people tend to do on posters, or maybe it's just the fact that I'm warming up to the whole idea of this four-quel; either way, I take this as yet another sign that director Rob Marshall is doing something right with the movie, and it might be possible to get back to the exciting energy that made the first Pirates film so great to begin with. Check out the poster below, click on it for the larger version at IGN, and expect lots and lots more marketing as we get closer to the film's May 20 release date.